The group played at a local music festival the day before with a backup band, but they won’t have one this afternoon. This wasn’t crushing news, since I really wasn’t expecting that setup. This was PassCode’s first overseas outing, and my expectations were realistic. Yennung was there, and he told me the unsuspecting audience yesterday was awe-struck. I could’ve been there, too, but it really didn’t matter that much now. It was already a small feat I’ve made it to Taipei. The building doors were scheduled to open at 11AM, and I joined the line where more than a dozen local and Japanese fans gathered. I was waiting at the main entrance, they were at the rear one, but I wasn’t my camera-wielding, gig photographer self this time, so it didn’t really bother me I won’t be front-row, center. I was introduced to the group as Filipino, and that my favorite member was Yuna. I did manage to prop myself as third in line at the venue’s entrance. The collective vibe was calm but excited, but that broke into silence when the girls appeared, then returned with bubble tea in hand. This was the second time the voice in my head pointed its finger at me and exclaimed: NO REGRETS! The venue’s entrance, where we queued at the same location later that day. 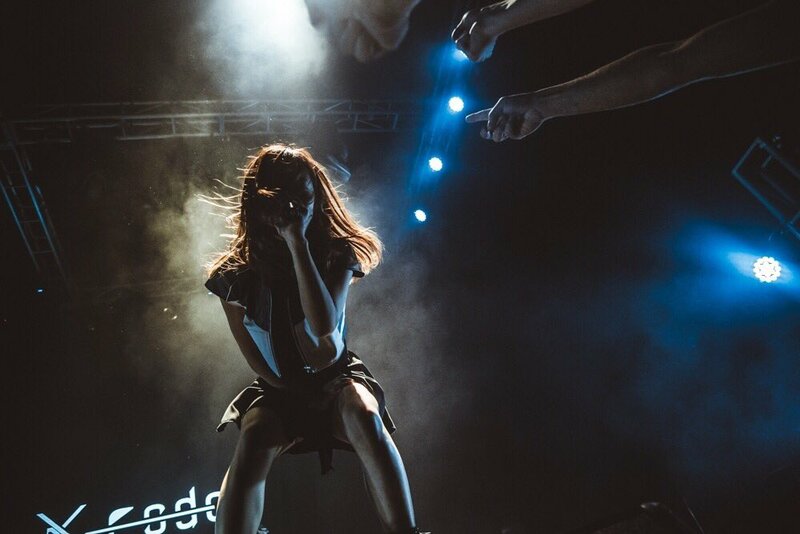 PassCode’s second album, Virtual, was a shoo-in favorite release from last year. It was obvious refinement from their debut album. Miss Unlimited, their latest single, their major label debut, was a step towards a heaviness I didn’t know they can achieve, much less go for. Historically speaking, I go weak witnessing heavy metal female screamers and growlers. Yuna, the group’s assigned screamer, was now put forward in the song mixing, and her parts just don’t come up in place of the guitar solo/breakdown anymore. They did thirteen songs. We spent a good few minutes collectively shouting for an encore, but we didn’t get any. As long as they did “Never Sleep Again“, and “Trace“, I have no reason to nitpick and complain. Idol events don’t end on the stage though. A bee line will form on the merch table, where among the shirts and CD’s, there are cheki tickets to be had. I had experienced this once before, where you purchase a ticket to speak to your chosen idol for a minute or two, then get photographed with her on instant film. This time, I wasn’t going to feel guilty that I only went for the popular member, because I’ll be getting tickets for all four. I started with the dimpled Kaede. I spoke zero Japanese, but my intro was easy and ready. Hello. I’m from the Philippines. Whatever comes after will be whatever the language barrier allows. We had the shortest chat of the four. I didn’t expect herself to be so, so disarming. Hinako, the stand-in singer for the group recordings, emanated this Disney princess, kindhearted persona. This came through well-enough during our chat, where I expanded my intro to mention my flight path. She said xiaolongbao, and surely if we did speak the the same language, I’d tell her that soup dumplings was also something Shanghai -my current city of residence- takes pride in, and that they should go there. All of them. Very soon. Nao’s handshake was firm, as if she was on some campaign trail. She wore that three-striped white bomber jacket she’d always wear in the non-performance videos I’ve viewed online. That pretty face had piercing eyes that locked on you with generous intensity. Yuna’s cheki queue was the longest. I told the same story. She asked the photographer what the word for “stay” was. I said no, I’m just staying in Taipei for the gig. She also said xiaolongbao. I concurred with an oishi. I told her she was lovely, but by then, I was more than aware that maybe the best I could do was just leave an impression that I was happy to be there. Tag me ill-prepared, I’ll still wave a flag of victory for all this. Days later, after a binge on her Twitter feed, where she would post photos of gifts from fans, I wished I bought her something, anything. In bed later that night, I scanned for their social media updates. They went to a local night market, the same night market I visited after dinner, before calling it a day. That perked me up, but I was exhausted. Exhausted, but immensely satisfied. “Passcode” was just a search string I used to habitually type on the Youtube or Twitter apps. Past noontime the day after, as I wait at the boarding gate for my flight back, I fancied the thought that they could be catching the same plane, since I can hear small social pockets of Nihonggo spoken around me. *Source for post’s main image.